The Penguins came into Game 2 looking to avoid going down 2-0 heading to Pittsburgh, and in a low scoring contest that saw the Capitals make a priority of getting back and preventing rush chances it was the Pens coming out on top with a 2-1 victory. Carl Hagelin and Eric Fehr scored the goals and Matt Murray stopped 23 of 24 the shots he faced, but the story of the game is likely to be the atrocious job of the referees. For the 2nd straight game, the officials blew an objectionable offense, giving Brooks Orpik only two minutes for interference when he went out of his way to cheapshot Olli Maatta, and Washington scored their lone goal after Kris Letang was whistled for a legal body check. It didn't take long for the Capitals to continue their dirty play from Game 1. The Pens went on an early power play after Brooks Orpik targeted the head of Olli Maatta on a late hit in during a Pittsburgh rush, leaving Maatta down on the ice and slow to get up. Somehow, someway, the NHL's officials didn't learn from missing a blatant knee-on-knee hit from Tom Wilson on Conor Sheary and inexplicably didn't give Orpik a game misconduct. Now, it's on a largely incompetent Department of Player Safety to finally hand out justice that has been lacking in the series. Pittsburgh wouldn't score on the power play, but it would seem to jolt them into action after a sluggish start to the game. While the Pens were able to keep the Caps from registering many shots on goal through the majority of the period, they weren't able to generate many legitimate scoring chances on the other end, working mostly from the perimeter as Washington made it a priority to collapse their defense in front of the net. Washington would get a power play late in the period after Evgeny Kuzentsov forced a Ben Lovejoy turnover in Pittsburgh's zone, and Lovejoy would take a slashing penalty as Kuznetsov drove the net. The Capitals would have several good chances on the man advantage, but Matt Murray was up to the challenge and the Penguins killed off the minor. The teams would enter the intermission still scoreless, and the Penguins would get their second power play of the game as Matt Cullen drew a holding penalty from Kuznetsov as he drove the net. The Pens wouldn't be able to generate much of a scoring threat, and the Caps were able to kill off the Pittsburgh opportunity without much difficulty. Midway through the period the Pens would finally break through and open the scoring. Nick Bonino grabbed the puck from a board battle in the corner and took it behind the net, where he found a wide open Carl Hagelin in front who on timed the puck over Braden Holtby's shoulder to make it 1-0 Pittsburgh. They'd nearly stretch the lead to two seconds later with pressure on the crease but couldn't get the puck past Holtby. Washington would nearly tie it moments later when Jason Chimera unleashed a shot from the left circle that beat Murray glove high on the far side that hit off the post and ricocheted away. Pittsburgh would get another chance on the man advantage after the Capitals were called for having too many men on the ice. The Penguins wouldn't be able to score on that opportunity, nor would they be able to late in the 2nd period when Taylor Chorney picked up a roughing call on Cullen in the corner. The team was unable to generate offense with the man advantage, and the inability to do so would be a big factor in keeping it a one goal game. The Capitals would seem to get the tying goal late in the 2nd period on crazy scramble in front of the Penguins' goal, but Kuznetsov was called for goaltender interference on Murray, taking out the Pittsburgh netminder right before Nate Schmidt shot the puck into the empty net. It was immediately waved off on the ice, and the penalty gave the Pens their 5th power play opportunity of the night. They were able to do a better job of generating offensive chances, but they still were unable to get the puck in the net, and the penalty expired seconds before the clock hit 0:00 on the period. Pittsburgh would take the 1-0 lead into the second intermission, but with 4 power plays in the 2nd period they surely would have liked to have built that lead up more. Getting the next goal would be huge for both teams, and the Capitals would be gifted a power play early in the 3rd period after Kris Letang was called for tripping when he stepped up on Nicklas Backstrom and cleanly checked him to the ice. Naturally, the Caps would capitalize when Marcus Johansson was able to poke in a loose puck sitting in the crease behind Murray. A pair of penalties, Matt Niskanen for hooking Nick Bonino and Bonino for roughing Niskanen, would open up the ice with 4-on-4 action midway through the 3rd period, but it wouldn't be enough for either side to break the tie. Matt Murray wasn't tested much during the first two periods, but he was huge for the Penguins in the 3rd period, making save after save on good scoring chances for the Capitals to help keep the score tied. His efforts paid off with 4 and a half minutes remaining in regulation as Eric Fehr tipped in an Evgeni Malkin centering feed as Pittsburgh retook the lead 2-1. Washington would pull the goalie and get good pressure in the Pens' zone, but after a series of icings and big stops by Murray the horn sounded to give the Penguins the win. Washington came into the game with a defense first gameplan, and it showed in the possession game as the Penguins enjoyed a score-adjusted 58.3 CF%. 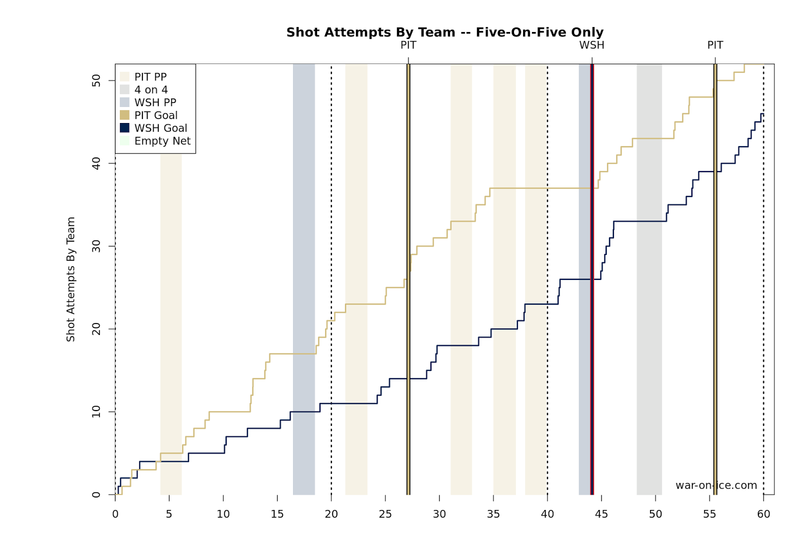 It was a strategy that allowed the Caps to limit the speed of the Pens in the neutral zone, but with as large of a disparity in shot attempts as there was, Washington was lucky to have been in a position to still win the game in the 3rd period. Pittsburgh now has taken the home-ice advantage, and it'll give Mike Sullivan the advantage to better get the matchups he's looking for at home as the Hagelin-Bonino-Kessel line has shown that the Penguins have the edge in forward depth.